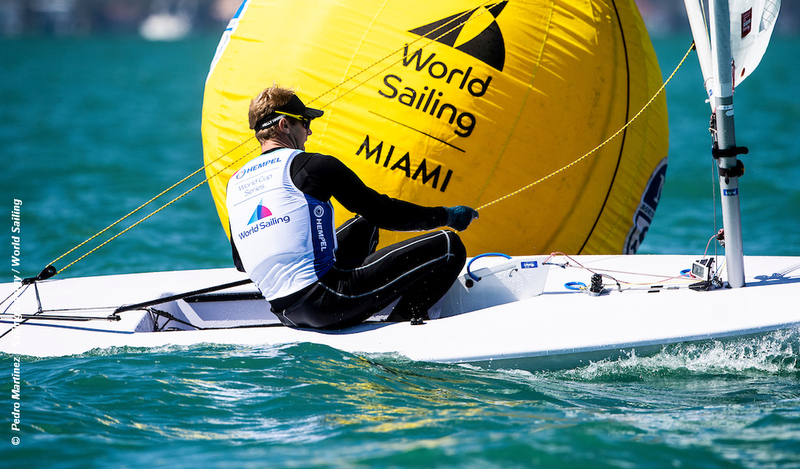 Day 6 of the Hempel World Cup in Miami will see medal races for the the Finn, Laser, Radial and the two 470 events. The five final medal races were scheduled to take place in the order: 470 Women, 470 Men, Finn, Radial, and Laser, from 17:00 hrs UTC. The forecast was for 6-10 knots on the racing area, but was mainly around 4-6 knots. First up was the women’s 470, although the British pair, Hannah Mills and Eilidh Mcintyre started in silver position, and led the early stages, they lost out on the final run. Winners were Frederike Loewe and Anna Markfort of Germany, with Fabienne Oster and Anastasiya Winkel also of Germany taking second and Fernanda Oliveira Ana and Luiza Barbachan of Brazil in third. In the men’s 470, gold went to Frederik Xammar and Nicolás Rodríguez of Spain. Second were Anton Dahlberg and Fredrik Bergströmrt of Sweden and third Naoki Ichino and Takashi Hasegawa of Japan. Max Salminen took Finn gold ahead of Oskari Muhonen of Finland, who won the medal race, with third Luke Muller of the USA. Wind was really down to a crawl for the women’s Radial medal race, and the course was shortened. Dongshuang Zhang of China took gold, Paige Railey of the USA second and Vasileia Karachaliou of Greece completed the podium. And finally the men’s Laser. Gold was already claimed by Norway’s Hermann Tomasgaard (top image), with Sam Meech taking second before the medal race. Only Tom Burton in third place could be caught, but he finished safely to claim the final podium place. And that’s it for Miami 2019.